So.., it was a long time for me till now.. as I was disconnected with Internet world, since I joined Angelique International Limited. Finally, we’ve purchased and installed network connection with Tikona Digital Networks as our ISP. 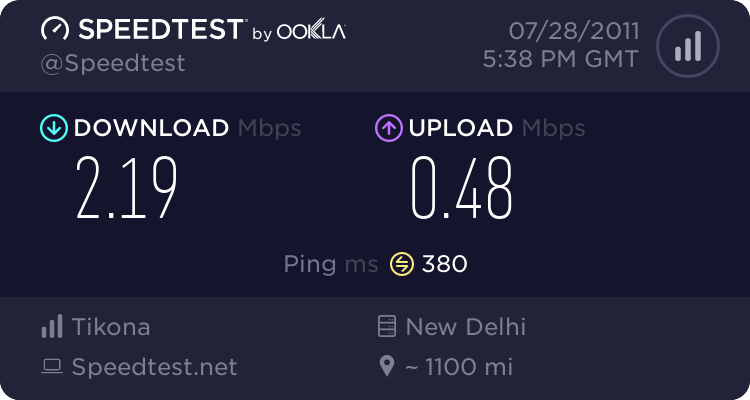 The connection just got installed an hour ago, before writing this…, So can’t give much of a review, but it seems like they are providing us with very good speed. So far, they have installed a device used to convert PoE to 10/100 connection, I’ve seen this kind of device for the first time. Talking about the speed.., here is the speed test result.. The device they installed looks like as shown here.., nothing else have been installed except this and a signal receiver on roof. I visited Delhi/NCR many times before, but now.., as I am living in this region my opinion about this region is all changed, this place seems to be a hell to me… So many people walking around at various public places, overcrowded stations, markets, hospitals etc. Earlier I use to visit Delhi and checkout the various shopping Malls, Restaurants, Places to visit like Qutab Minar, C.P., Delhi Gate, Daryaganj book market etc. But now, working here in Delhi NCR made me realised the level of difficulty of lifestyle in this region. Here I feel so time bound with a congested schedule, that I don’t get any time to think about myself, or about anything else… The day starts at 7.30 am, making a target to reach Mandi House metro station by 8.30 am. Then, at 9.30 office timings start, and you become free at 6 pm, and then you realize that all of the day is gone, and there is no time for masti.., So, you are left with weekends for masti. Well… thats enough for me, but then, I don’t have any close and good friend of mine around with whom I can enjoy. So, you miss your friends once again..
Anyways.. Talking in general, Life in a NCR appears to be costly living and it feels like people don’t have time for themselves, and other’s emotional values. Well guys.. Last month was pretty busy, so could not find time to update my blog. But there are lots of things around me to share with everyone, like… I am now working at Angelique International Limited, Noida. I joined this company on 15 June 2011. Since then, I was busy at my job, so could not find time to write on my blog.